If you broke your linux and need to undo a change, you can do it by either using a bootable key and change the file through it like showed in here or avoid running /sbin/init. You wonder why? Then read what follows! 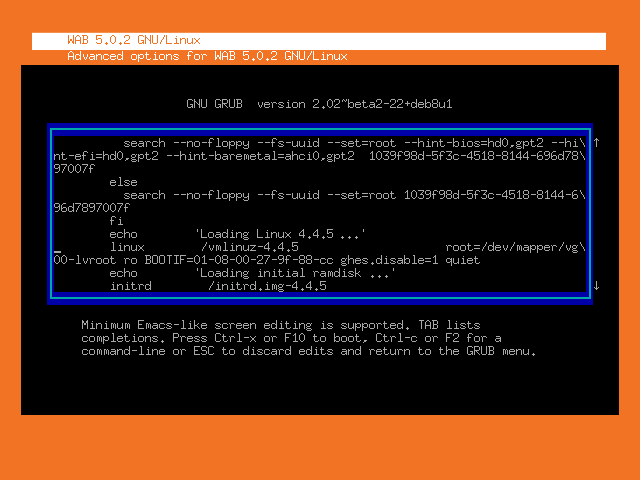 The first thing to do is to edit the boot line of your distribution when you're on the grub. Generally, it's the key 'e' but it might change, depending on your system. Then go to the line starting by "linux". Then press the button to boot (in my case, this is CTRL-X or F10). Once done, you should be on a command line. Congrats, we have prevent the init program to run!